The District Six Museum was established out of a grassroots movement against Apartheid forced removals called “the Hands off District Six” campaign‘ as a locus for the community and a place to creatively work with and celebrate their memories. It is a people’s museum that reconstructs the recent past using personal, community and iconic Apartheid objects, photographs, soundscapes and oral histories as the central elements of its exhibitions and expressive art. The main museum is housed in one of the District’s original churches that had been used as an activist rallying point to protest the demolitions, apartheid laws and repression. It regularly organizes guided walks through the District, memorial ceremonies, popular education processes, cultural performances, and frequent community social events. 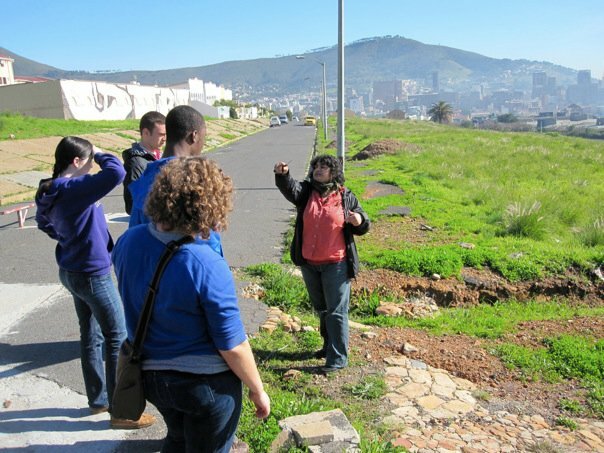 The Museum also plays a central role in the redevelopment of District Six’s original land and the resettlement of the community through its research and popular education. Nearly all of its founders and staff are from the District and almost everyone played an active role in its struggle against Apartheid. It advocates on behalf of many low income township residents and ex-District Sixers on issues of community development, social justice, reimagining community and human rights education. The Museum is also an international Site of Conscience and regularly participates in solidarity conferences with current and former terrains of struggle internationally. It has regularly hosted initiatives, such as exchanges and solidarity programs in US and Palestine. In addition to the museum in the old Methodist Church, they also operate the District Six Homecoming Center, a former warehouse now renovated to house temporary exhibitions, workshops, performances, and the beginnings of a digital arts clubhouse with a sound booth. The community is eager to be a part of the Solidarity Studios and work with other artivists in sister cities Chicago and Bethlehem. Please check out their awesome website to learn more about the museum and show your solidarity by clicking here!